Our European activities extend to every corner of the continent. They include manufacturing plants, logistics hubs, sales and marketing businesses, R&D facility, training and design centres, a world-class motorsports operation and thousands of local retailers. Our European story may have started in a very modest way, with small numbers of imported vehicles brought here in the early 1960s, but since those days we have invested in making Europe one of our most important and vibrant global markets - not just for selling cars, but a place for designing, engineering and building them, too. We recognise that European customers are among the most discerning and demanding when it comes to quality and performance, so the things we can learn and achieve here can give us a real advantage when developing vehicles for other parts of the world. The very first Toyota – Toyopet Crown – arrived to Malta in the summer of 1960. Fast forward to 2016 Geneva Motor Show where the Toyota C-HR made a world premiere, it was designed in Europe and is built here - too. Since the early 1990s we have transformed our activities in Europe. After establishing successful sales operations we decided to set up local manufacturing operations to build cars specifically for European customers. A small-scale vehicle assembly plant was established in Portugal with Salvador Caetano in the mid-1960s, prior to us launching manufacturing operations on a major scale. We started with engine and car plants in the UK in the early 1990s, and have gone on to expand production at sites in France, Turkey, the Czech Republic, Poland and Russia. Benefiting from investment so far of more than €9 billion, our European manufacturing plants have together delivered more than 10 million vehicles. As well as directly employing around 20,000 people, they also provide business worth more than €6 billion to a network of around 400 European suppliers. Toyota Motor Europe HQ plays a central role as the business in overall control of the wholesale sales and marketing of both Toyota and Lexus products in Europe, via 29 national sales and marketing companies operating in 53 different countries. Toyota Motor Europe Headquarters in Brussels, Belgium. 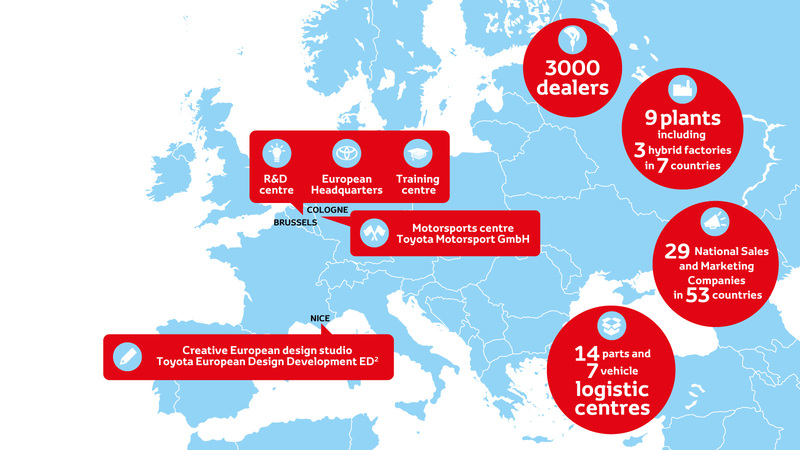 Toyota European map of Operations. We work over 400 European suppliers spending 6 billion Euro annually. We've put on European roads over 2 million hybrid electric vehicles! We've built over 10 million vehicles in Europe. 8 out of 10 Toyota cars sold in Europe are built here, too. All our European sales and marketing operations are overseen by Toyota Motor Europe, which has its headquarters in Brussels. The Belgian capital is also home to European R&D operation and technical training centre. ED2 – short for European Design Development – is our European design studio in the South of France. It is responsible for many different aspects of design, including vehicle exteriors, interiors and colours, the production and development of models and design surveys. Recently it has taken a leading role in developing the key new models, including the latest styling revisions to the Yaris and the all-new Toyota C-HR crossover. We believe it is important to make cars local to where they are sold, a philosophy we apply in Europe where we have nine manufacturing sites in seven countries, producing nine different models – Aygo, Yaris, Auris, Toyota C-HR, Camry, RAV4 and, for export only, Land Cruiser – plus engines and transmissions. Three of our sites, in the UK, France and Turkey, build hybrid models and our UK engine plant manufactures 1.8-litre hybrid petrol engines. Every day we ship thousands of parts and vehicles across the whole of Europe. Our logistics operations have to make sure the parts our factories and dealerships need, and the vehicles our retailers and customers have ordered, are in the right place at the right time. Our supply chain group includes a central European parts centre that supplies regional depots and we also have a series of strategically located vehicle distribution hubs that handle both our European-built models and those shipped here from overseas. Our 29 European National Marketing and Sales Companies take care of marketing and sales to our retailer networks in 53 European countries. Our European retailers – the first point of contact for most of our customers – currently number more than 3,000 for the Toyota and Lexus brands combined, providing new and used vehicle and parts sales, servicing, maintenance and repairs. Toyota Motorsport GmbH (TMG) is our dedicated, high-performance testing and development facility, located in the heart of Europe, in Cologne, Germany. Built and equipped to the highest standards, with no compromise in quality or functionality, the premises extend to 30,000m². TMG has a staff of around 200, covering a wide range of specialist skills and expertise.